Public cloud is compute and storage services offered on demand. By tapping into these services, organizations can gain agility, the ability to grow and shrink in footprint in seconds and a pay as you model. Last month, we conducted a webinar about public clouds discussing their similarities and differences. We specifically focused on Amazon Web Services, Microsoft Azure and IBM SoftLayer. Today we examine, briefly, how these three public cloud providers handle security and provisioning. We invite you to view our entire presentation here for a more detailed discussion. A common question from organizations of all types and sizes is how does the security work? First, let’s look at Amazon Web Services (AWS). AWS has a shared security platform. You the customer are responsible for security in the cloud and AWS is responsible for the security of the cloud. 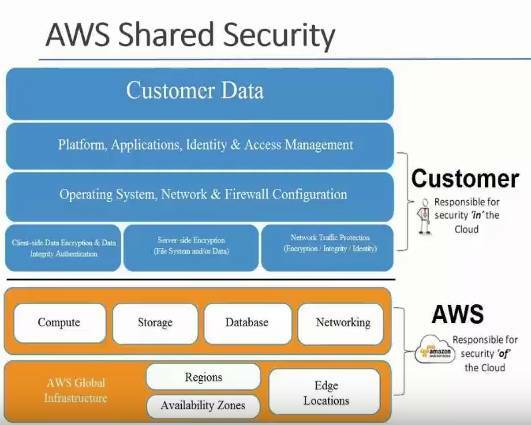 Below is the AWS security break out – what you do and what they do. You can clearly see where the “responsibility line” is drawn. IBM SoftLayer takes this same approach of shared security, but SoftLayer allows you to tap into third party software to move the “responsibility line” up depending on what you want or don’t want to manage. That is not an option with AWS. Finally, Microsoft Azure also manages the security of the cloud and requires you to manage the security of the data in the cloud, but the key difference is Azure works on a fixed security process. Azure has a required set of procedures that you must follow inorder to guarantee not only the security of your data but also the security of the cloud. IT teams versed in Microsoft thinking will be able to make sense of this security format much easier than teams new to Microsoft. Amazon Web Services and Microsoft Azure are true public clouds so provisioning can be completed within minutes. With AWS this ease of set up also means that you can easily grow which can also mean run into budget/spending surprises so monitoring AWS use is very important. One notable difference between AWS and Azure is that Azure is more difficult to de-provision. Once you increase your performance level on Azure, reducing your footprint can take time. IBM Softlayer is a bit different. Using Bare Metal, SoftLayer actually offers you your own physical hardware in the cloud so you have more control. This can take longer to provision, up to 48 hours. Evolving Solutions is here not only to help you weigh what public cloud option is best for your organization but also to assist with set up and management. We will work with you to ensure your cloud solution is SAFE – Secure, Accessible/Available, Foundational and Efficient. Again we invite you to view our entire public cloud presentation here or contact us with questions.